The tutorial is as follows but can also be downloaded here & the shape templates can be downloaded here. Measurements have been written on the templates as files & printers may alter the size. Reduce or enlarge to the appropriate size. Cut out the template shape, trace onto matboard. 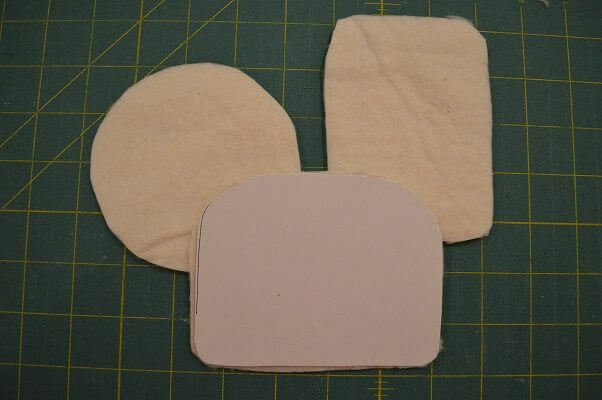 Cut out the shapes an with exacto and/or scissors. 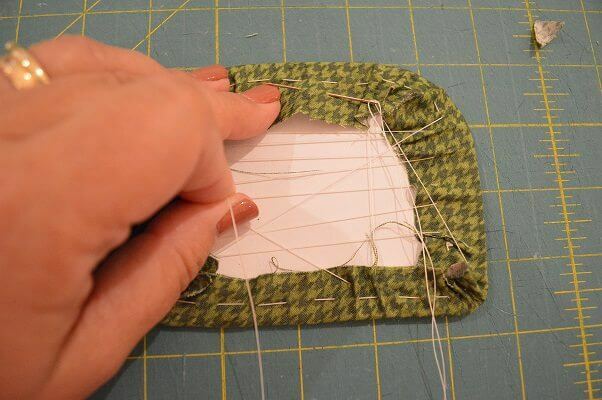 Hold the cut shape under the stitched piece up to a light to make sure you like the fit & adjust as necessary. Once matboard is cut to the desired shape, trace around it onto a piece of cardboard for your ornament back. Cut out cardboard shape. Line the matboard piece with 2 layers of thin cotton batting (front of ornament) & 1 layer on the matching cardboard (back of ornament). 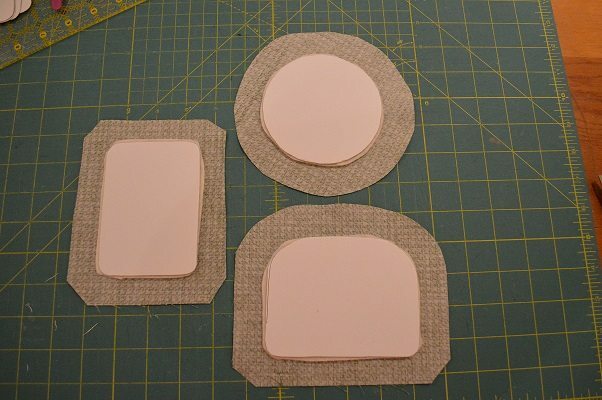 Use double sided tape to keep bottom layer in place. Note: the next few photos will show lacing with a cotton fabric. This procedure will be done with both the stitched linen & the cotton backing. 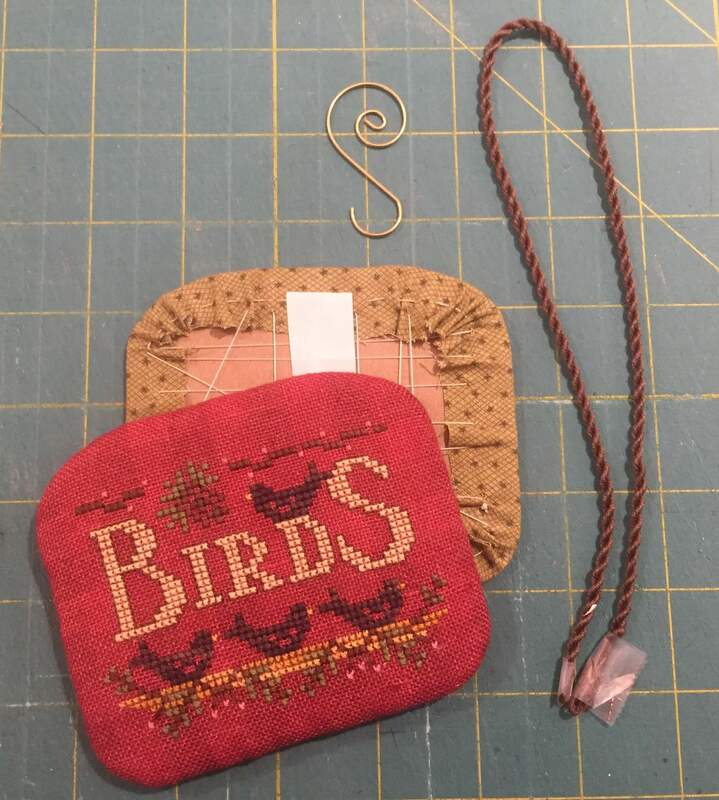 Prepare both your stitched pieces & backing pieces by trimming the linen and cotton to approximately 3/4” away from the edge of your matboard. 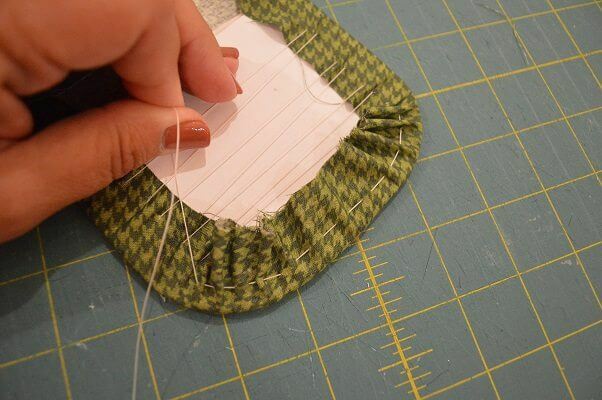 Trim the corners slightly to reduce bulk as you lace. Thread a sharp needle with a long length of lacing thread. Knot the end. 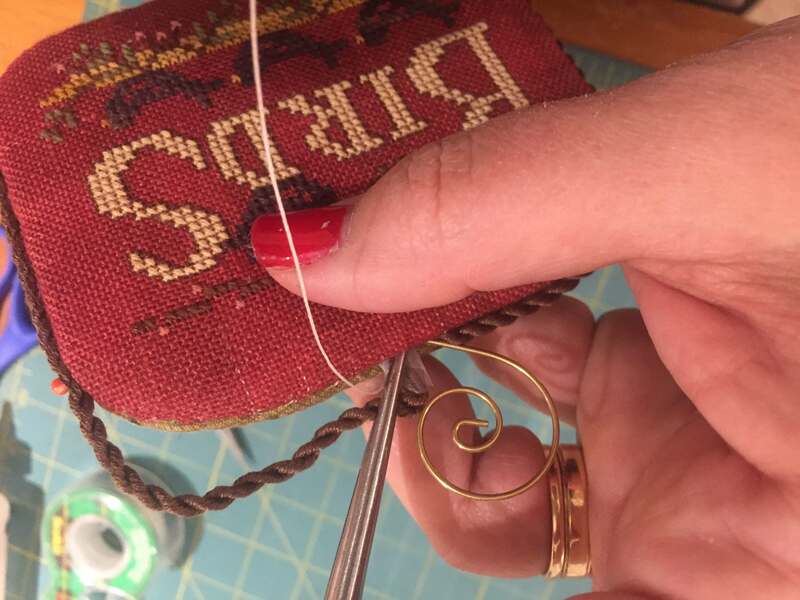 I use upholstery thread or crafting thread for lacing. 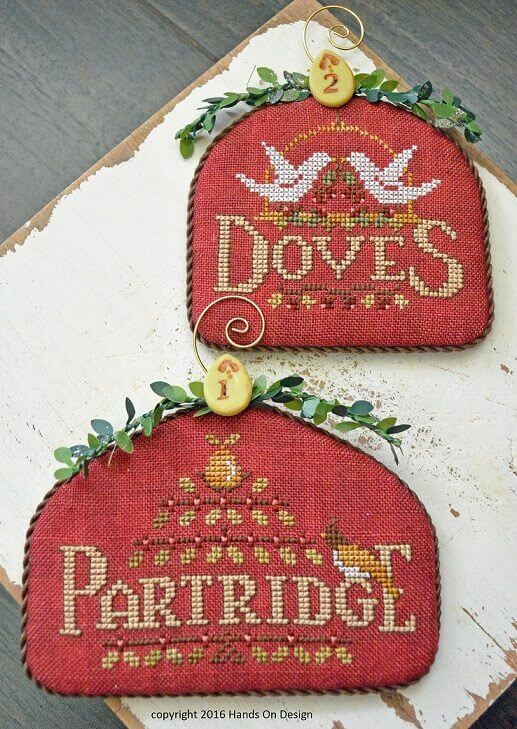 It can be purchased at craft stores. Linen thread is also a good lacing thread. 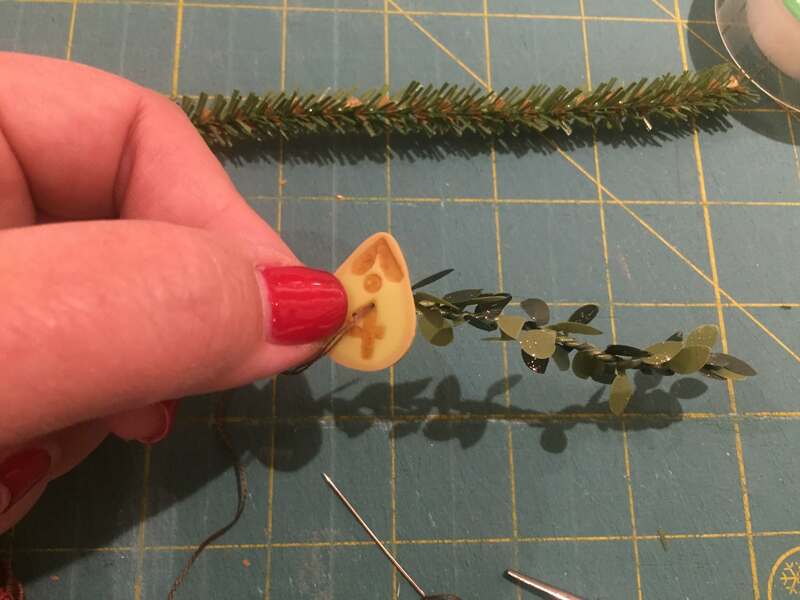 Start by lacing across the widest portion of the ornament. Pull evenly as you lace. As you come close to the curved corner, check the stitching on the front side & move the linen around as necessary to keep design centered. As you come to a curved corner, run the needle in & out of the fabric in a gathering/basting motion. Hint: sometimes it is helpful to tie an anchor knot just before gathering the corner—it keeps your previous lacing tight. Continue with a gathering stitch across the top side of the linen to gently curve the stitched piece to the matboard. gather the corner on the opposite side as you did the first corner. gather this corner as you did the previous corners. 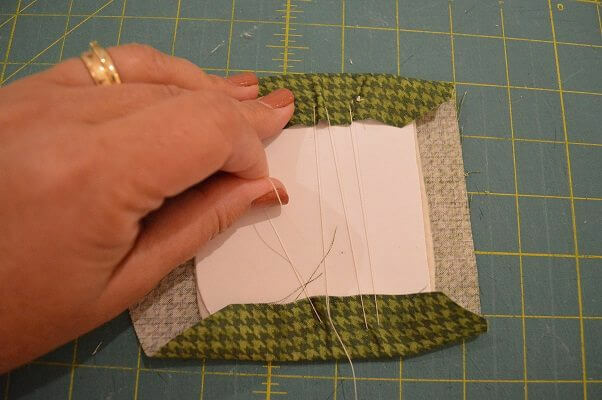 Continue with a gathering stitch across this side as well & gather the remaining corner. 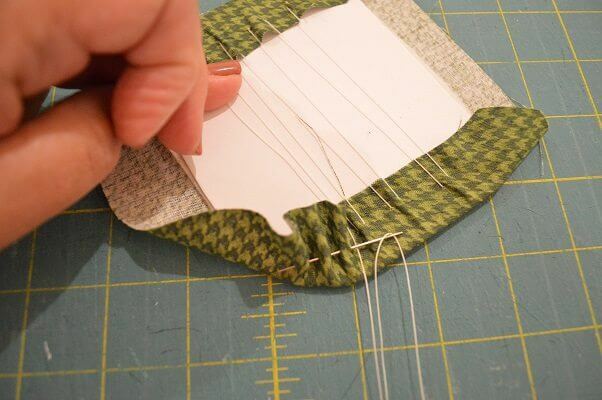 Cinch up all of your gathering stitches tightly. 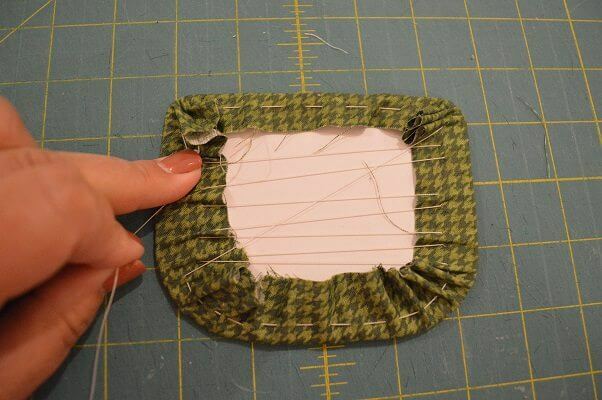 Be sure to occasionally check the front of your stitching to make sure it is still centered. Now lace the top & bottom sides that you previously gathered. Use the same scooping motion you used on the first side. Gather your laced front & back a piece of twisted cord & ornament hanger. Thread up with another piece of lacing thread & a sharp needle. 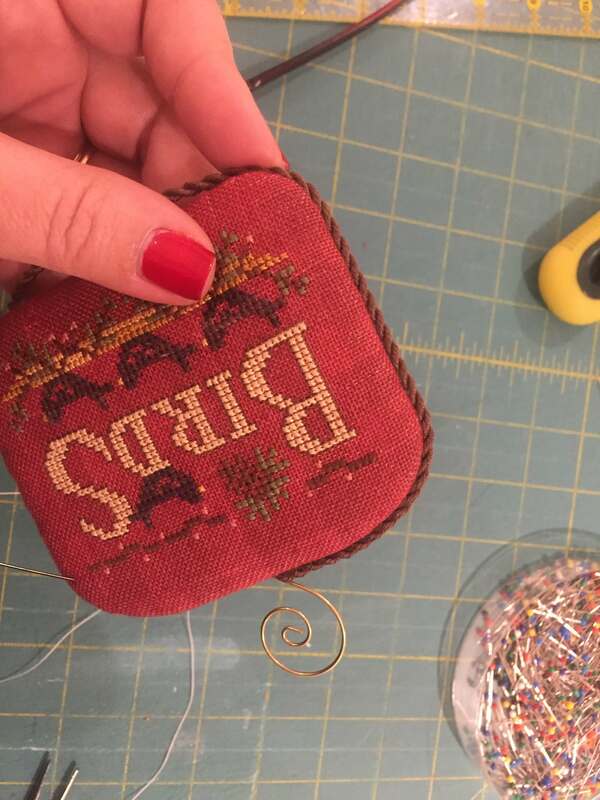 If you are afraid that your stitches will show, try using a thread that matches the color of the linen. 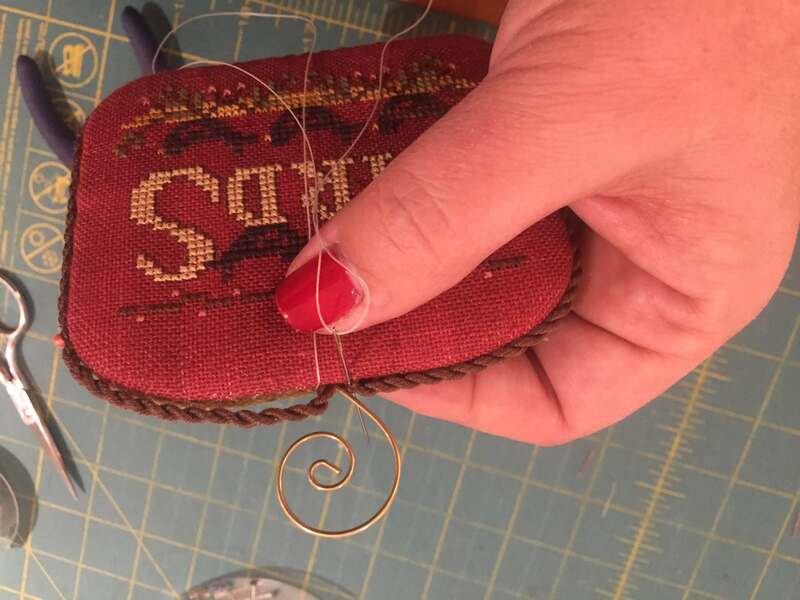 Anchor your thread inside the ornament on the backing fabric with a knot. Slip stitch the front to the back starting at the top center. Keep your stitches close to the edge so they won’t be seen (we will be covering this with cording. Continue to slip stitch the front to the back, stopping at the 4th corner. Note: I have taped the ends of the cording as it is less bulky than a knot. 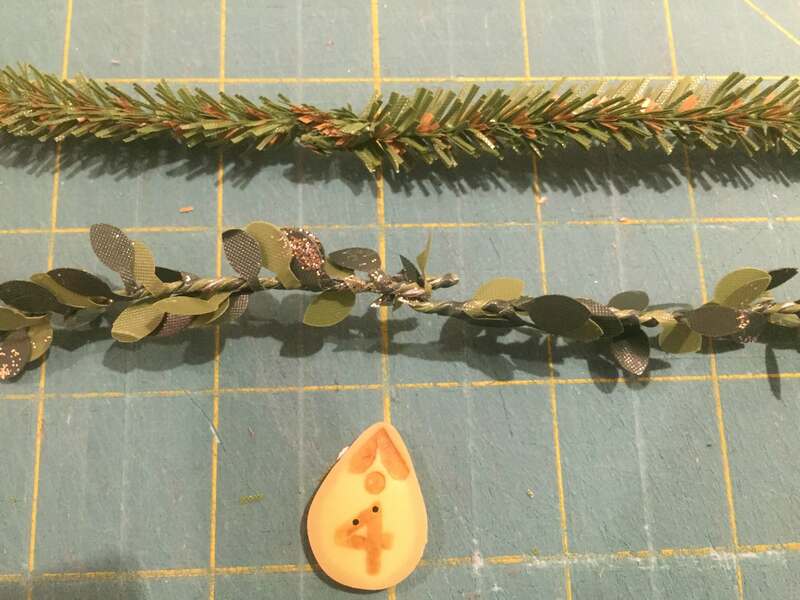 Run a thin bead of glue around the edge of you ornament to attach cording. It is helpful to put pins in the corners through the cording until the glue dries. Hold glued cording in place with a pin where you stopped attaching with glue. I find it helpful to run the needle & thread around and through the two ends of the twisted cord. This brings them together to give a crisp finish. Carefully run a dab of glue under that last section of twisted cord. 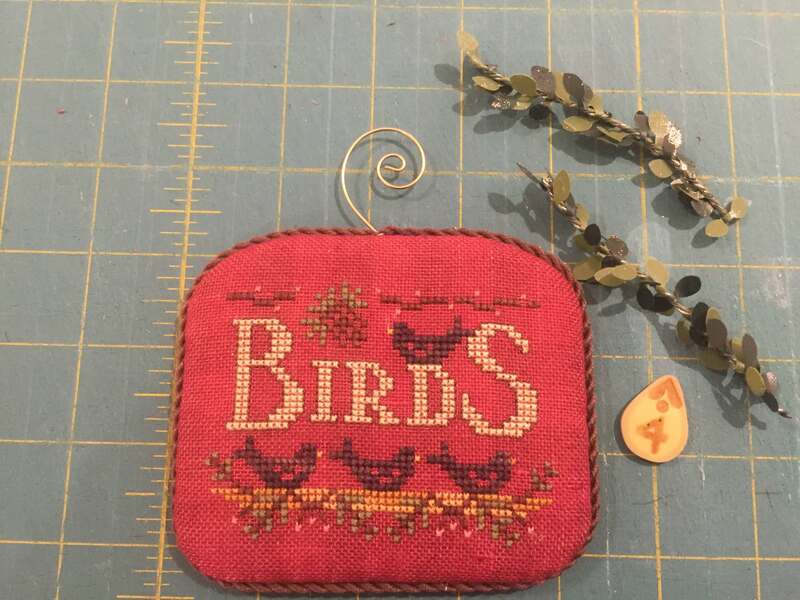 Grab your JABC buttons, some mini-boxwood trim & finished ornament! 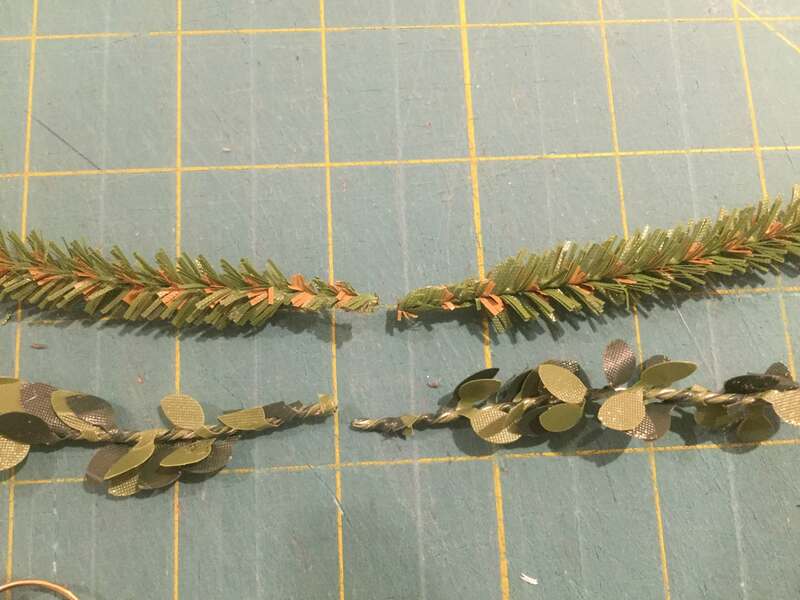 Use needle nose pliers to fold the pruned end back on itself to create a hook. Hook the 2 ends & crimp closed with the pliers. Attach the JABC button: run brown thread through button holes and around the trim several time & secure on the back of trim. 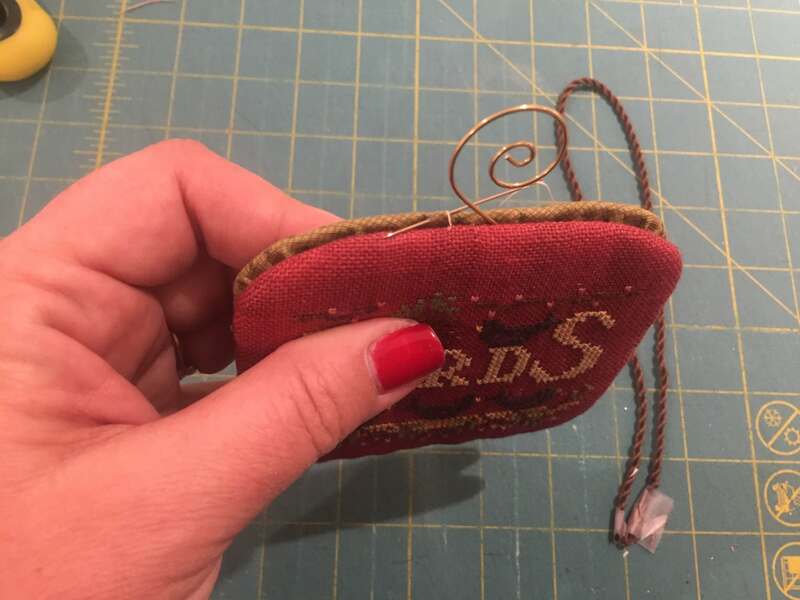 Before you cut the brown thread, anchor trim & button to the top of your ornament—it is easiest to run your sharp needle through the cording. Knot to end! 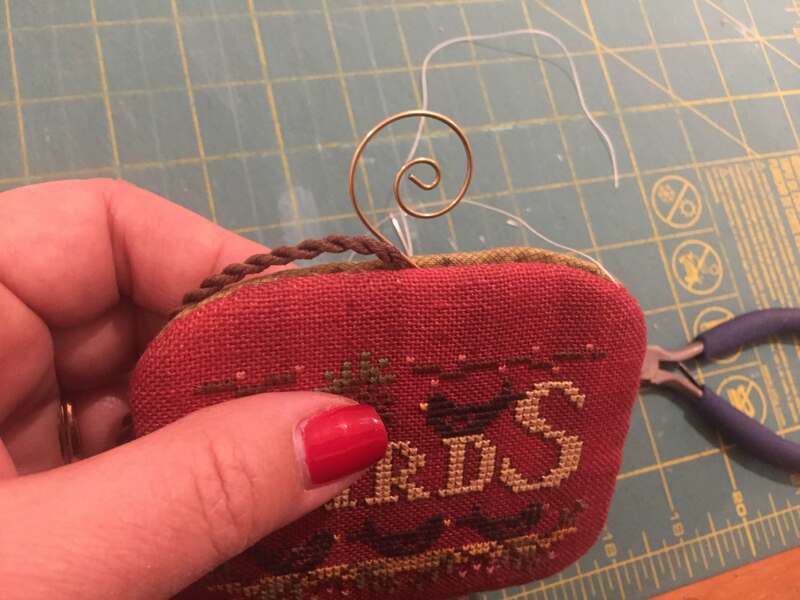 12 Days of Christmas Finishing Tutorial ©2017 Hands On Design & Cathy Habermann. 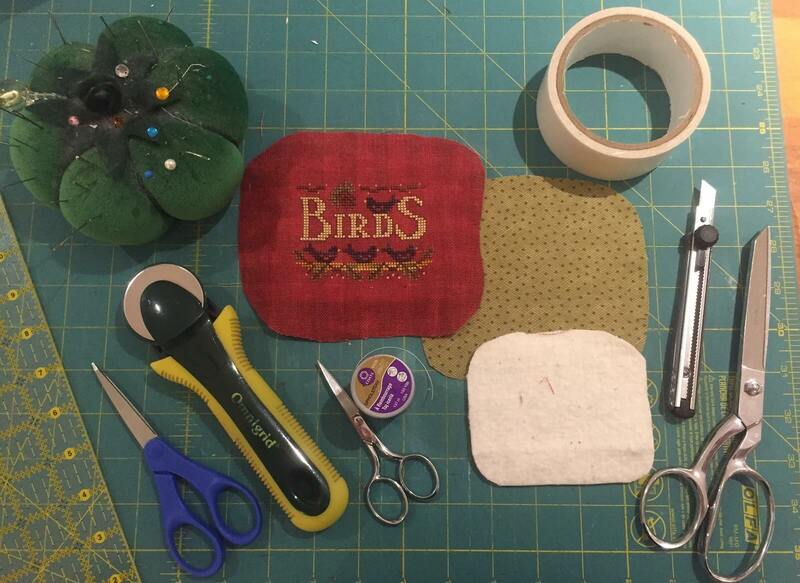 Permission is granted for Shops & Stitchers to print & distribute for classes & personal use. Reposting is permitted with proper reference to http://www.handsondesign.biz These instructions are complimentary & not for resale. Images are the property of Hands On Design & Cathy Habermann. Where did you find the sWIrly ornament hangers? Do you have a source you can share? Hi Mary – I purchased mine last fall at my local Walmart (25 for $1.99) – you can also purchase them at the big box craft stores. All to soon, they will start having their holiday items out for sale – I would say by July & August you will be able to find them there!